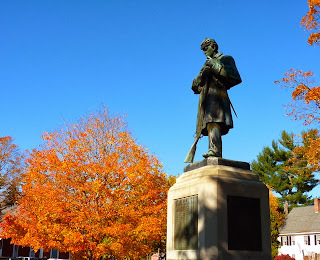 The Civil War from a New Hampshire perspective. Monday 11 December 2013 was a wet, cold, snowy evening in Amherst Village, but 50 citizens ignored the elements, journeyed to the Congregational Church and were rewarded with a unique view of our own Civil War. 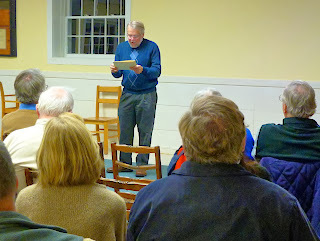 Neal Benner arranged to have Concord Monitor, editor emeritus, author and historian Mike Pride address the society. The Concord resident and former Nieman Fellow at Harvard University, has authored five books concerning this significant era. "No historian has been more imaginative than Mike Pride in weaving together the intricate relationships between home front and the army. 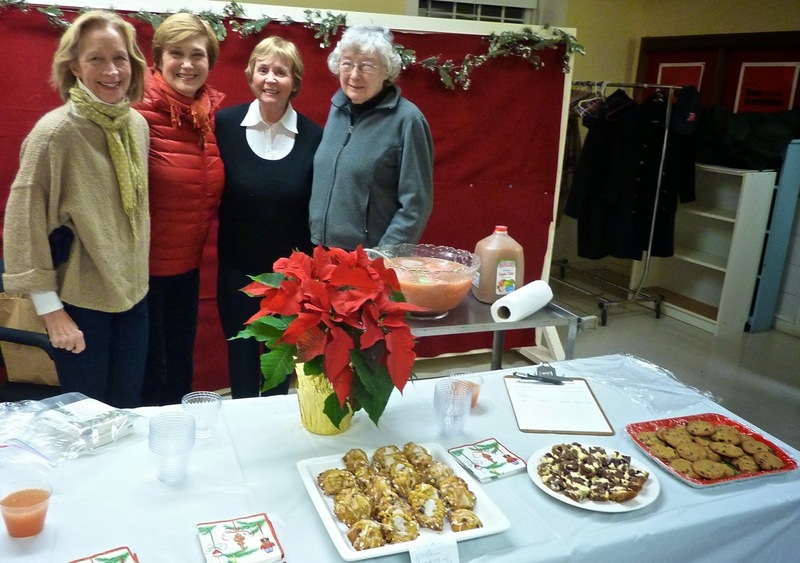 Beautifully written and brilliantly researched, compelling and important"
Sue Clark, Linda Peck, Carolyn Quinn and Helen Rowe gather at the hospitality table. Thank-you to the bakers and the Quinn's for their generous support and providing us with refreshments. 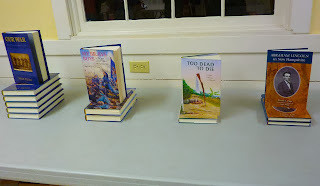 Four of Mike Prides books that were available to purchase at the meeting. 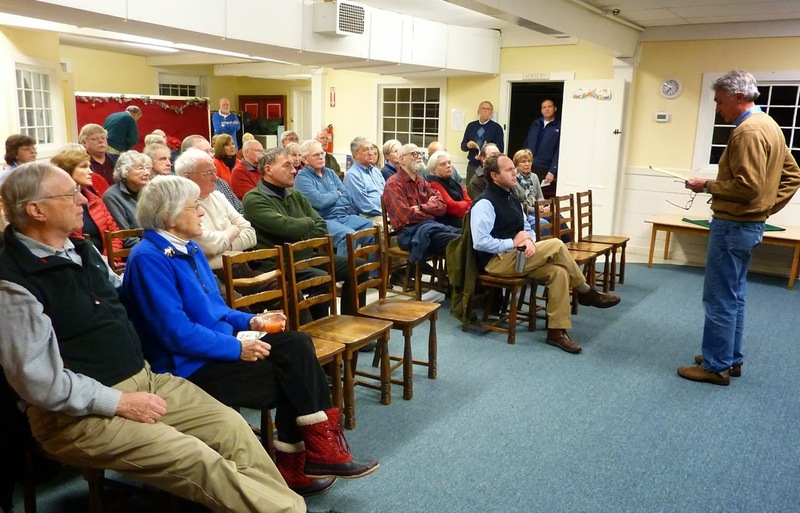 Mike Pride, far right, speaking with society members before the meeting was underway. 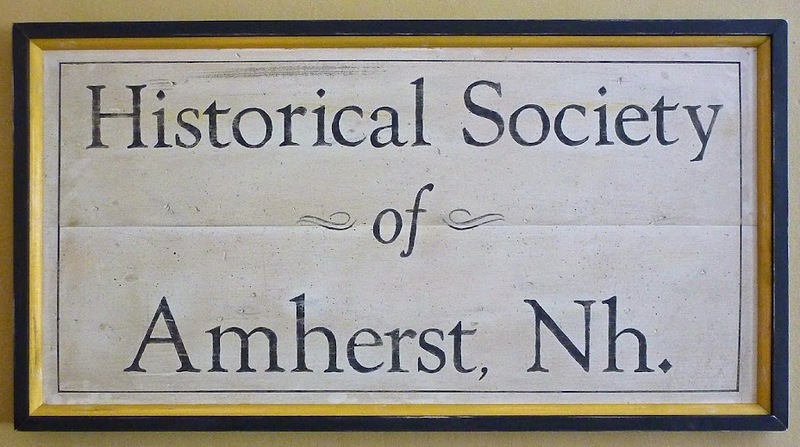 Historical Society of Amherst's president, Dave Clark addresses the very large gathering of members to inform them of our current status and future plans. 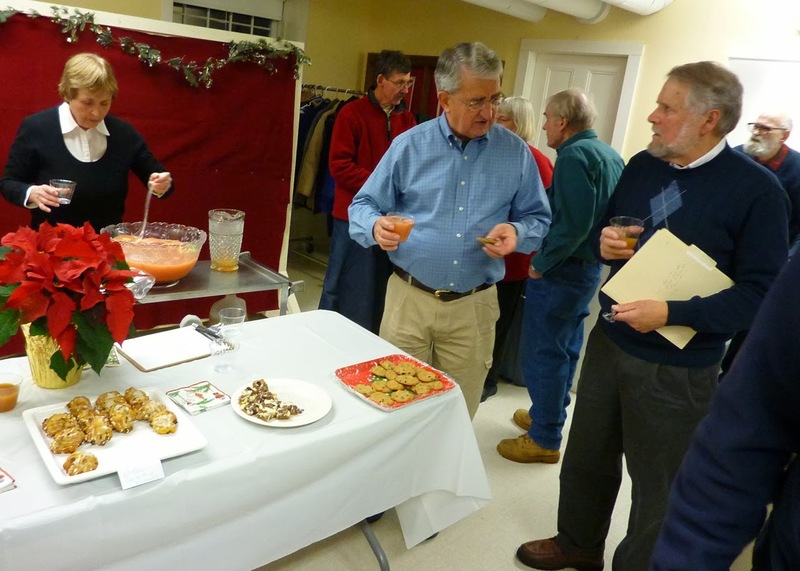 His primary goal is to educate townspeople of the importance of the Historical Society and it's benefits to attract new members. To learn more or to acquire a membership form, please click over to our website. Also, if you aren't a member and would like to attend a meeting/presentation, please drop in; everyone is welcome. 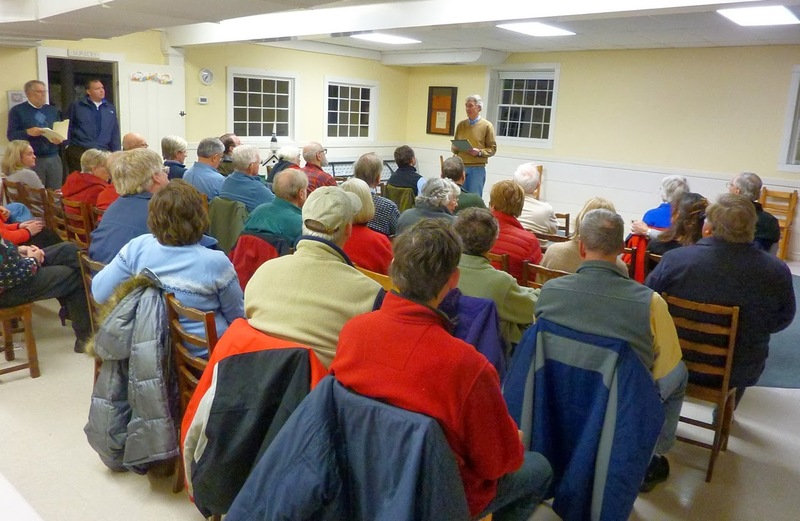 Our next meeting will be at the Congregational Church at 7:30 p.m on Monday, February 10, 2014. 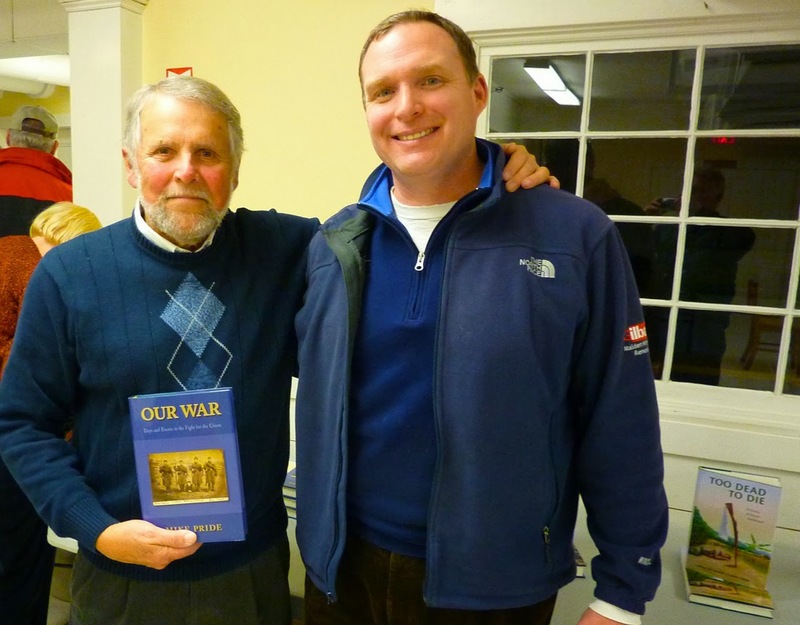 Former Concord Monitor editor and established author Mike Pride speaks of his latest book OUR WAR, that weaves a moving story using soldiers letters, diaries and contemporary newspaper accounts to personalize Americas bloodiest war. 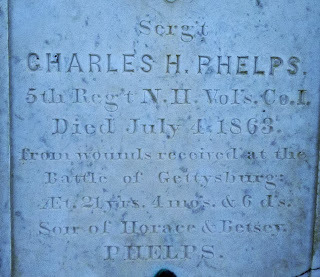 Members learned of Amherst resident, Sergeant Charles Phelps who died from wounds received at Gettysburg on 3 July 1863 at the young age of 21. 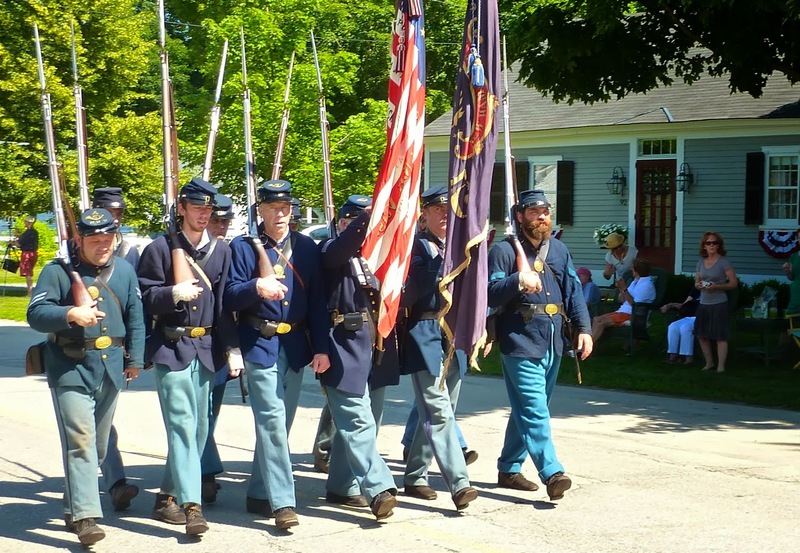 In all, our small town sent 25 young men, many of whom are buried at Meadowview Cemetery, to fight in the Civil War. Mike Pride holding his latest book with Society VP and Program Chair Neil Benner. Neil has done a wonderful job providing members with new and interesting speakers. Tonight was an excellent example as 50 members and a few new faces (hopefully future members) disregarded snow, sleet and cold temperatures to listen to Mike's presentation. Erected in 1871 and dedicated in 1890 to honor 25 Amherst soldiers who died in the Civil War, this monument stands in the center of Amherst Village. Would you like to learn more about the Civil War? We can and don't even need to leave Amherst to do it. Click over to the Amherst Library website to learn of their Programming series starting on January 5th and continuing through January 28 that features noted speakers concerning the Civil War. 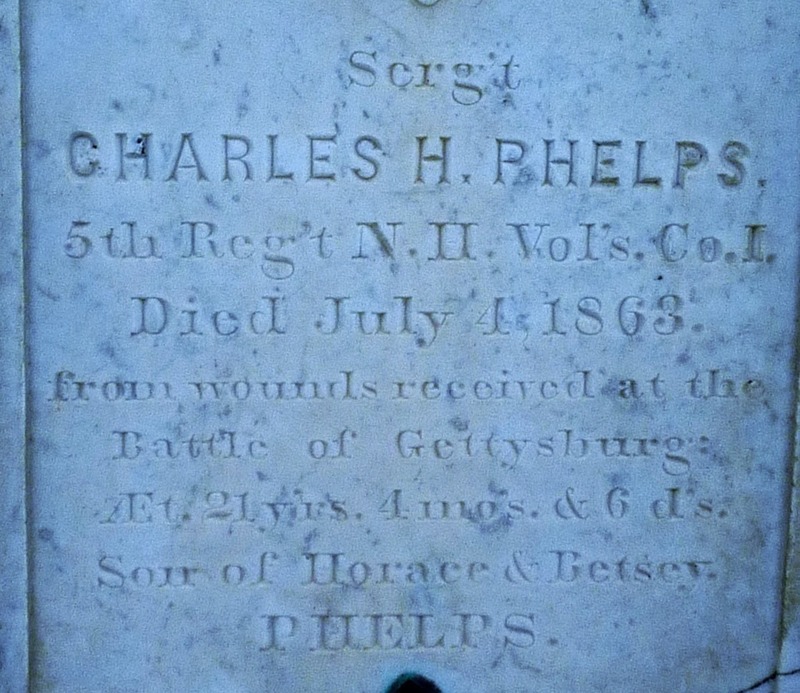 A little about Sergeant Charles Phelps from Amherst, NH. 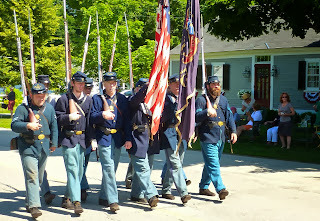 5th NH volunteers, India Company. The Farmers Cabinet, Amherst, NH 16 July 1863. 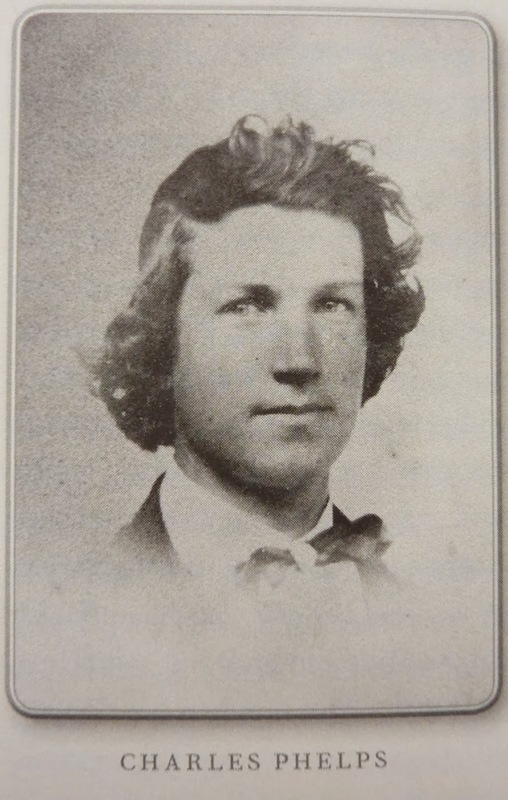 Upon notification of his death, Horace Phelps, the Sergeants father, sent a "hired man" with a wagon to Gettysburg, PA to retrieve his son's body for burial. His funeral was held at the Congregational Church in Amherst, built as the Second Meetinghouse in 1774. Sergeant Phelps grave marker at Meadowview Cemetery, Amherst, NH. Around the periphery are the engagements in which the Sergeant fought with the Gettysburg campaign listed at the bottom. 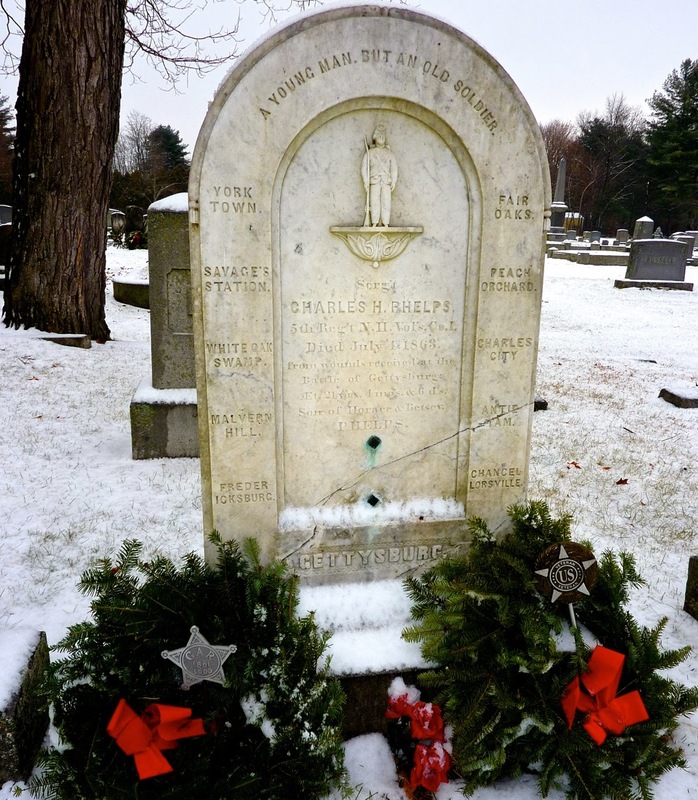 A note of thanks to our own Marie Grella and friends who decorate veterans graves with wreaths and flags during the holidays. She and member Jackie Marshall also supply and place veterans markers, two of which are seen here by the wreaths. For more information about these historic markers scroll down five posts. A close up, a little easier to read of Sergeant Phelps stone. 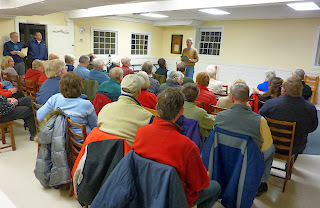 Our next meeting will be at the Congregational Church at 7:30 p.m on Monday, February 10, 2014.